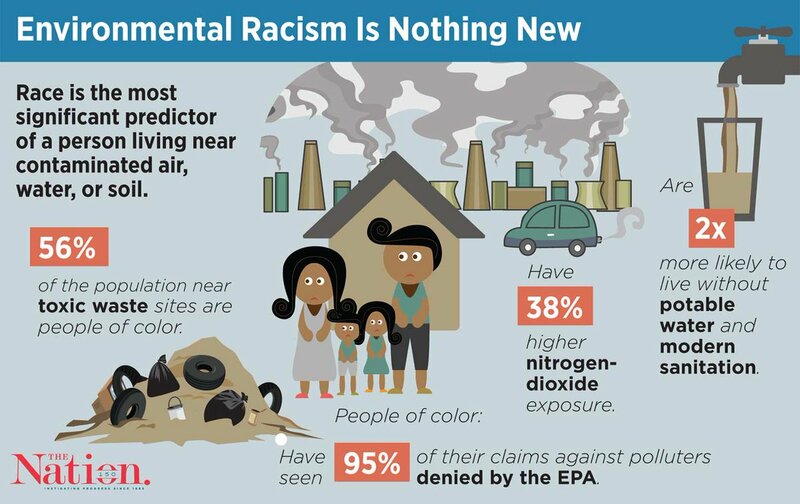 There have been some victories in fighting back against environmental racism. In Diamond, LA, a small, African-American neighborhood, was sandwiched between two large Shell Oil plants. For years, residents lived with an inescapable acrid, metallic odor and a chemical fog that seeped into their houses. They experienced headaches, stinging eyes, allergies, asthma, and other respiratory problems, skin disorders, and cancers. Periodic industrial explosions damaged their houses and killed some of their neighbors. Protests eventually led Shell to agree to relocate the residents. Let me lay some historical context for this. The economics of slavery wasn’t just that the landowners got cheap labor. They got cheap dangerous labor. Slaves could be and were subjected to dangerous levels of heat, and mosquito-borne illnesses such as malaria. After the civil war and a brief period of reconstruction, we re-created our habits of enslavement under other names: the share-cropping system and the prison system, for example. We also continued our national long-standing habit of subjecting people of color to greater environmental risks. The segregation created under the Jim Crow era, and continued through red-lining practices, did not merely concentrate minorities together – it concentrated them together in the more dangerous areas – or in areas that we then were more likely to make dangerous by putting pollution there. It’s been 30 years since the UCC report, Toxic Waste and Race in the United States. Where are we today? More than half of all people who live close to hazardous waste are people of color. Black children are twice as likely to suffer from lead poisoning as white children. Childhood asthma, linked to exposure to pollution, has actually been declining since 2011 – after rates doubled in the 1980s and 90s. So that’s good news. Still, more than 14 percent of black children have asthma, compared with about 8 percent of white children. And black children are also much more likely than white children to suffer severe complications. The response to Hurricane Maria’s devastation of Puerto Rico has been lackluster compared to the response to Harvey in Houston and Irma in Florida. The pattern of treating people of color as mattering less continues. I’ve noticed that sometimes among Unitarian Universalists there’s what feels like a split. Some of us are more oriented to Climate Change. Nothing else really matters if we don’t ensure a future for the planet. Some of us don’t get so worked up about CO2 because unarmed young black men are being shot by police. But at root, it’s the same issue. If we create a world where we don’t trash people, we can’t trash the planet. Environmental justice is not about environmental equity -- not about redistributing environmental harms. It's about abolishing them for everyone. It's about, "No more disposability." A world without disposable people, without disposable communities, without disposable species, will require a world without disposable plastics. "No throwaway planet" and "no throwaway people" are one concept, one idea, one value. This is part 2 of 2 of "Environmental Racism"
Thanks for placing some attention on the destruction of the environment by supremacists who think they can benefit in some way by poisoning some areas and not others.Don't they know it ultimately affects us all.We realize now they cannot be allowed to do this.